Ph.D. in Veterinary science is a 3-year higher level academic program in the domain of animal medicine, treatment and rehabilitation with a focus on delivering therapeutic care to animals. It is a doctorate level research-based academic course that can be pursued by M.Phil/Postgraduate candidates. The minimum eligibility criterion for admission is 50% marks at Post Graduate qualification/M.Phil level in the subject. The fee for the course ranges from 30,000 to 3.5 Lacs across various colleges and universities in the country that are offering the course. The variation in the fee is based on the location and type of university that is private/deemed or government. Ph.D. in Veterinary course admissions are done on the basis of percentage of marks obtained by the candidate at Post Graduate (PG)/M.Phil level. Apart from merit-based process colleges/universities take admissions based on the score of some popular entrance exam for Ph.D.
Those students who are looking for a grant or scholarship for the purpose of pursuing their doctorate in the said subject would have to fulfill the required eligibility criteria along with clearing of a respective exam for that purpose) in order to receive the grants. The course is an effectively structured academic certification aimed at providing detailed knowledge and skills to the students in regards to Veterinary science so, as to make them well aware of each and every aspect related to the domain. A doctorate in Veterinary Science pass out student has a variety of options to choose from in terms of his/her career. He/she can make a start with firms/in areas such as Breeding farms, Dairy departments, Drug research, Disease Investigation, Vaccine production, etc. Students of Ph.D. in Veterinary Science are well equipped in terms of knowledge and skills of the subject and are hence, suitable for undertaking various roles at the practice level. A fresh pass out can expect a starting salary of anywhere between INR 20,000 to INR 22,000 per month. The average salary range across the country varies with a little variation here and there. Eligibility M.Phil./Post Graduation From any college/university with a minimum of 50% (relaxable for reserved category candidates) marks. Top recruiting areas Breeding farms, Dairy departments, Drug research, Disease Investigation, Vaccine production, etc. Job Profiles Animal Farm Manager, Veterinary Doctor, Biological Scientist, Pharmacist, Store in charge, Veterinary Consultant etc. Ph.D. in Veterinary: What is it About? Veterinary Science as a subject deals with the academic interpretation and analysis of diagnosis, treatment, and rehabilitation related aspects of the animal health care. Being a crucial asset for economic and other perspective animal welfare becomes an important area of study and research. Over the years the domain of veterinary science has become a specialized sub-domain of medical studies dealing holistically with animal health and treatment. A doctorate level course in veterinary science churns out a veterinary professional out of a research student by equipping him aptly in an academic and practical manner through the gradual and progressive nature of course design and academic calendar. Ph.D. in Veterinary course achieves its aim by incorporating subject based theoretical model of study long with practical based practice model of study. A good number of colleges across the country offer the course to candidates who have passed their PG/M.Phil from a recognized state or central University. He/She shall not be having any backlog or compartment in any of the subject/subjects at PG/M.Phil level that is yet to be cleared at the time of taking admissions. Certain Institutes grant admissions through Common Entrance Test (CET) like ICAR, TANUVAS etc. To get admission in these institutes candidates would have to qualify the respective entrance exam by securing minimum qualifying marks. Most Universities/Colleges offer admission based on the score of CET or conduct their own entrance test for admission into Ph.D. courses hence students would have to make an application for such exams. The course has a variable time duration of 3 to 5 year and the syllabus is divided into various domain related subject and practical/research modules. The detailed description of the syllabus is tabled below for your reference. Ph.D. in Veterinary: Who Should Opt for? Students who have done M.Phil/ Masters in the domain of Veterinary Science. Those who have a career as Veterinary Doctor in mind. Those who are looking for a career in Animal Pharmaceutical industries. Those are looking for a career as Veterinary Consultant. Ph.D. in Veterinarypass out students have plenty of options to choose from in terms of their career. 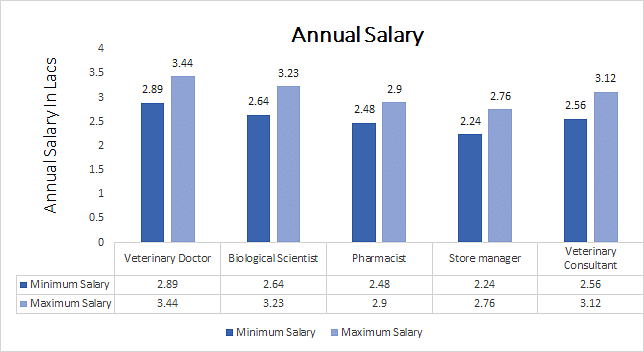 One can choose to work as Animal Farm Manager, Veterinary Doctor, Biological Scientist, Pharmacist, Store in charge, Veterinary Consultant etc. etc.